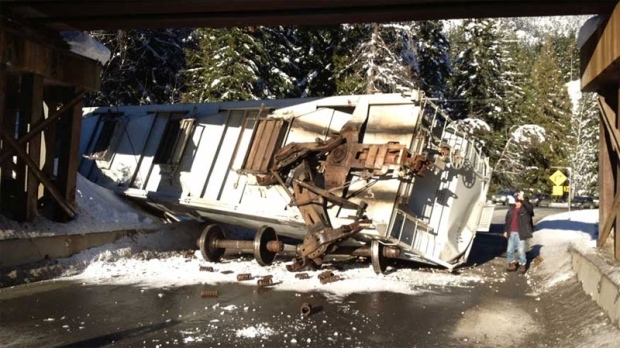 The Vancouver Sun recently reported that train derailments in British Columbia increased 21% to 110 incidents in 2013, the highest in 5 years, based on Transportation Safety Board of Canada data. That compared with 91 derailments in B.C. in 2012. Canadian National Railway was involved in 57 of the 2013 derailments, Canadian Pacific Railway in 50 and British Columbia Railway in 3. Three of the more significant B.C. derailments in 2013 involved Canadian National Railway trains. Twelve CN cars carrying sulphur derailed near Chetwynd on May 15, 15 cars carrying ore derailed near Tumbler Ridge on August 1, and the largest liquid spill involved a punctured CN locomotive fuel tank spilling more than 3,000 litres of diesel fuel on January 30 in a Prince George rail yard. Most derailments occur in rail yards or remote stretches of track far from the public eye and are unreported by the news media. Many B.C. municipalities are concerned about the increasing number of derailments. Belcarra Mayor Ralph Drew recently said the increase in derailments is worrisome, especially given the spike in shipments of oil by rail through B.C.’s mountainous regions. (Belcarra is part of Metro Vancouver.) Drew said he believes pipelines are safer than rail for transporting oil. “A derailment of oil tank cars in the Fraser Canyon would be catastrophic. It would move down the whole length; mind-boggling, actually. It makes a tanker spill at sea minor in comparison with the linear damage along the river, and it would ultimately end up in the Fraser River estuary, which is critical salmon rearing grounds”, he said. See CN Railway Derailments, Other Accidents and Incidents for hundreds of additional examples of Canadian National Railway derailments across Canada and the U.S.
~ by railroaded on April 26, 2014.